You can start brushing your child's teeth as soon as they start to come through. Use a toothbrush suitable for their age with a tiny smear of fluoride toothpaste for babies and children up to 3 years, and a pea-sized amount for children aged 3-6 years. Brush your childs teeth twice a day for 2 minutes. Not all children like to have their teeth brushed but it is important to keep trying. Babies and children should have their teeth brushed for them, or in additional to them doing it themselves, until you're sure they can do it well enough alone. This will normally be until they're at least seven. Brush the teeth in small circles, covering all the surfaces, and encourage your child to spit the toothpaste out afterwards. There's no need to rinse with water, as this will wash away the fluoride. There's no need to buy special "children's toothpaste" brands. In fact, some of them don’t have enough fluoride in them to help prevent tooth decay. Children of all ages can use family toothpaste, as long as it contains 1,350-1,500 parts per million (ppm) fluoride. You can easily find this information on the toothpaste packet if you're not sure, or ask your dentist. Make sure children don't eat or lick toothpaste from the tube. Take your child to the dentist when their first milk teeth appear. This is so they become familiar with the environment and get to know the dentist. Just visiting the dentist at this early stage is good practice for the future. It is important to take your child for regular dental check-ups as advised by the dentist to help prevent decay and identify any oral health problems early. Fluoride varnish can be applied to both baby and adult teeth. It involves painting a high-fluoride varnish on to the surfaces of the teeth every 6 months. It works by strengthening tooth enamel, making it more resistant to decay. Fissure sealants can be done once your child's adult teeth start to come through at the back to prevent them from decay. This is usually around the age of 6 or 7. The treatment involves covering the chewing surfaces of the back teeth with a special thin plastic coating to keep germs and food particles out of the grooves. The material is almost a liquid consistency which flows into the grooves of the teeth and is set quickly by a light. The sealant can last for as long as 5 to 10 years. Ask your dentist about fluoride varnish or fissure sealants. The main cause of tooth decay is not the amount of sugar or acid in the diet, but how often it is consumed. The more often your child has sugary or acidic foods or drinks, the more likely they are to have decay. So it is important to have sugary and acidic foods just at mealtimes where possible. Sugary and acidic treats should be limited and consumed in a short amount of time rather than over the space of a few hours or a whole day. Good snacks include bananas, pieces of cucumber or carrot sticks, toast, rice cakes, cheese or plain popcorn. Most fizzy drinks contain high amounts of sugar which causes tooth decay. The sugar free and 'diet' versions of fizzy drinks still contain a high amount of acids which can erode the outer surface of the tooth. Keep fizzy drinks to mealtimes to limit the frequency of sugar and acid attacks on the teeth. Even unsweetened juices contain sugars and acids, so although it can contribute towards your 5 a day, try to restrict your child to no more than one glass (about 150ml) of fruit juice each day and only at mealtimes. The best drinks for your childs teeth are plain, still water and plain milk. 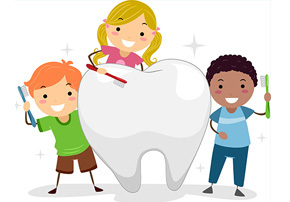 Ask your dentist for diet advice for your child's teeth if you are unsure.